Those reading this have probably heard plenty about the American dentist who went to Africa and killed a lion. If you have missed the outrage, and want to read the story that goes along with this picture, you can do so by clicking this link. I saw the picture (and the story) right after writing my blog entry for yesterday, "Cancer In Plants." When I was writing that one, my mind was on our economic, political, and social structures, the "human world" that we create. That's the world we can think of as our "civilization." 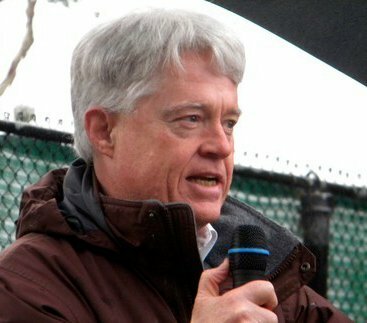 As in the case of the biological processes discussed by George Johnson, we serve ourselves best by working together, by focusing on the "we" not the "me." "We are in this together" is what I said. But let's not forget the World of Nature, upon which we ultimately depend. We are in that world "together," too, with all other forms of life. 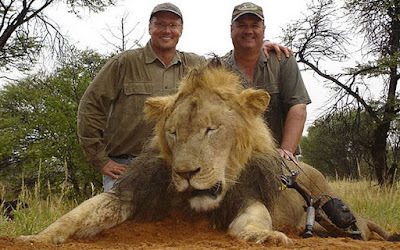 So, I suggest to Dr. James Palmer, the dentist who killed the lion, that he take that self-satisfied smile off his face. Same rule for all of us. This picture shows a crime against the possibility of our human survival over any longer term. On the savannas. In our cities. On the battlefields of our constant wars. We are in this together. Same rule for both worlds. Nature doesn't need people. People need nature.